This year our family plans to dramatically reduce our use of single-use plastics. One simple way to do so is by replacing our plastic wrap and food bags with home-made reusable food wrap. We all know the impact that single-use plastic is having on our planet. 40% of plastic produced across the world is packaging, used just once and then discarded. (National Geographic, 2018). Not only is plastic production and waste terrible for the environment, but the chemicals in plastic can also find their way into our food and drinks. The World Health Organization has shown that exposure to these toxins can pose potential health risks with some plastic food packaging being cited as of particular concern. So what can we do to reduce the impact of single-use plastics on our environment and our health? There is no doubt that plastic materials can be incredibly useful, but there are also areas in which their use can be reduced. With the added concern of the health risks of plastic contamination in our food, our use of it during food preparation, storage and transportation seems an obvious place to start. This is my fridge after a typical weekend. Lots of leftovers stored ready to be used up just as my mother did before me. All protected (or so I’ve always thought) with a clean layer of plastic wrap to keep my food fresh. Our lunch boxes are a similar story. Sandwiches carefully wrapped so not to let their contents contaminate the kid’s fruit and other snacks. Lots of single-use plastic – one of the most significant problems facing our environment today, and a simple place to make changes. 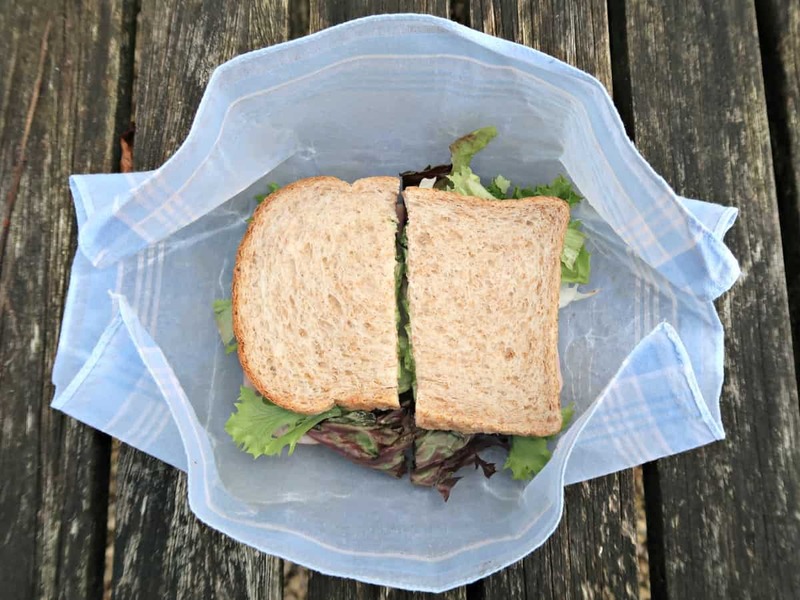 There’s definitely plenty of scope to reduce our plastic use by introducing reusable food wrap into our household! • Men’s Cotton Handkerchiefs (Amazon). • Baking tray and parchment. Reusable beeswax wraps are both cheap and straightforward to make at home. You can use any tightly woven thin cotton fabric to make the waxed covers such as old cotton sheets and make them any size and shape you want. We used a pack of 11 inch square men’s handkerchiefs for ours which were an unwanted present received at Christmas. They are the perfect size for wrapping a sandwich. 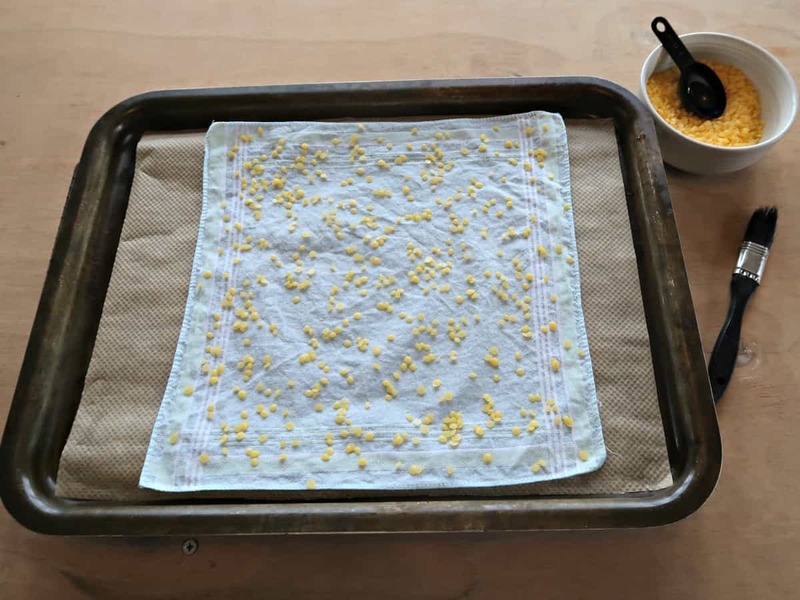 I used unrefined beeswax beads to make our reusable food wraps. It is possible to use beeswax blocks and grate them yourself, but this is quite a task so if you do buy the wax specifically for this project using the pellets makes this project much more straightforward. 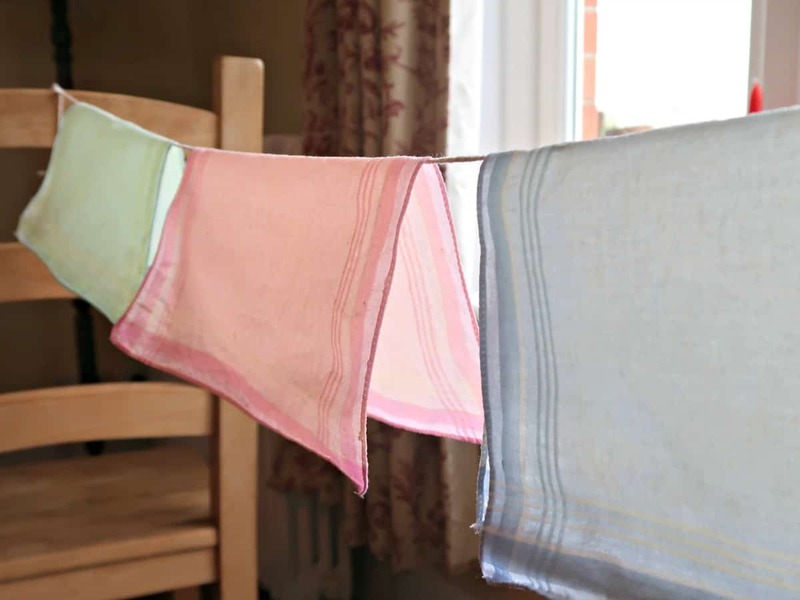 Before I started making our Beeswax wraps, I popped our handkerchiefs through a hot wash to remove any coating they might have on them. Line an old baking tray with baking parchment and lay the cotton piece you are using on top. Sprinkle 2 tablespoons of Beeswax beads evenly across the fabric’s surface, before popping into a low oven (about 140 C) to melt. I checked the progress every few minutes for the first one I made and found that mine needed about 8 minutes for the wax to melt completely. Once the wax has melted remove the baking sheet from the oven. 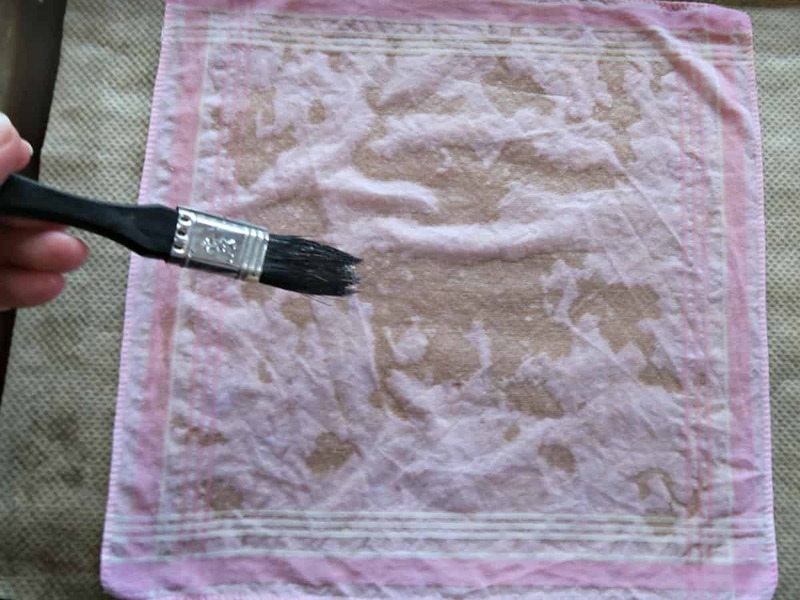 You can use the paintbrush to ensure you have an even covering of wax across the cotton square before it starts to set if you need to. I found the heat from the baking sheet kept the wax melted long enough to do this if I worked quickly. Hang your beeswax wraps up to set. I hung mine over a piece of string suspended between two chairs. They only take a few minutes for the wax to harden. 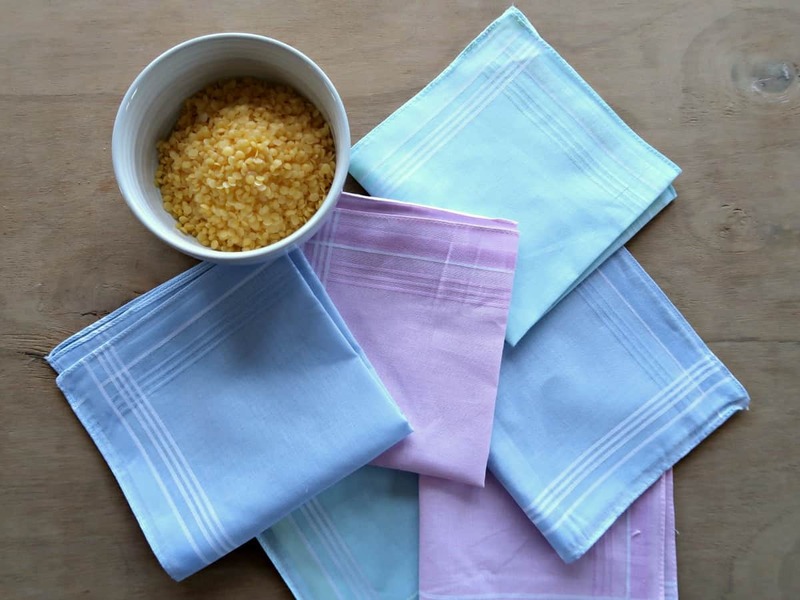 Beeswax wraps make great coverings for dishes and bowls. Holding the cover in place over the top of your container will allow the heat from your hands to mould the wax cloth to its shape and cling to the edges. 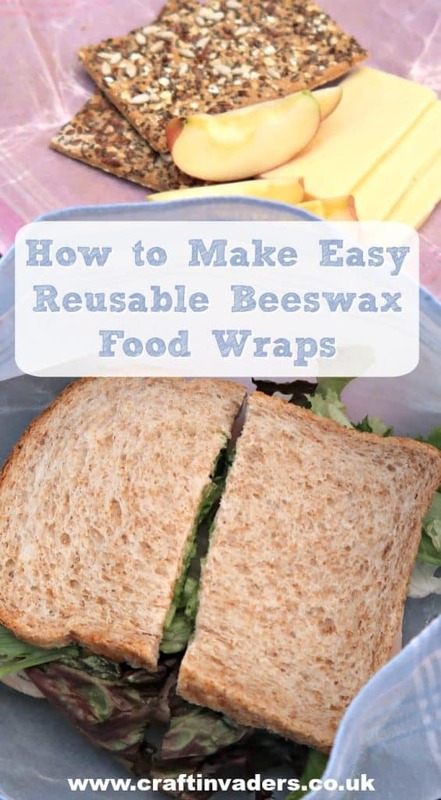 Beeswax is naturally antibacterial, so beeswax wraps can be wrapped directly around foods to preserve and protect them. We are using ours to wrap around sandwiches, cheese and cut vegetables with great success. The only item they should not come directly in contact with is raw meat. To clean reusable wraps wash in cool water with a mild detergent and a sponge or soft brush and leave to dry. The wraps will take on a creased look over time. You can quickly refresh your beeswax wraps if you wish by returning them to the oven and re-melting the wax. 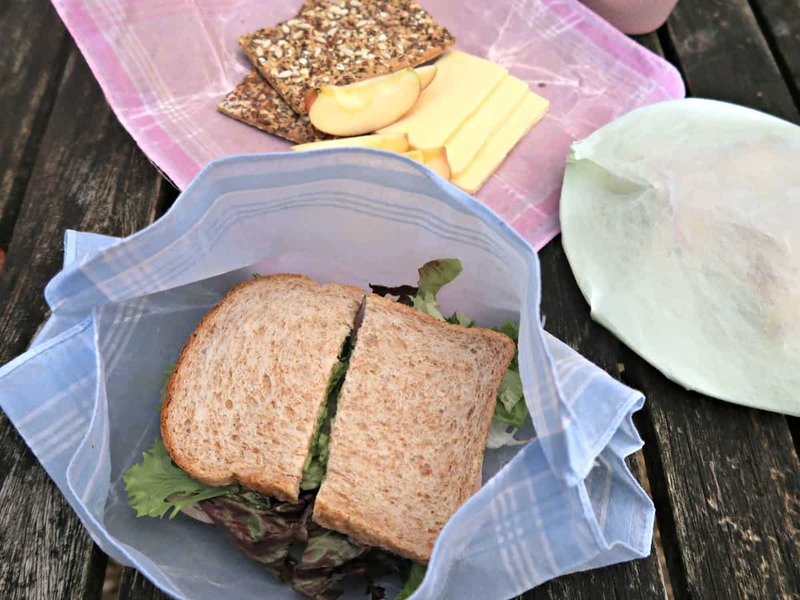 We think home-made reusable food wraps are one brilliant way to reduce the use of single-use plastic and we will be using ours for all our packed lunches. We have blocks of beeswax kept from when we used to keep bees. I shall be making some of these wraps and try to encourage family and friends to try using them too. Brilliant gift idea! Thanks. Ah brilliant – I have been looking at buying some of these as clingfilm is next on my list to get rid of, but I reckon I can make these instead. Thanks for the instructions! Would it be possible to use the beeswax hand bath I have to dip the fabric in? I think you’d end up with too much wax on the fabric Carolyn, really you want the wax you put on to soak in. I suspect any excess would crack and flake off. Thanks for the handkerchief idea! 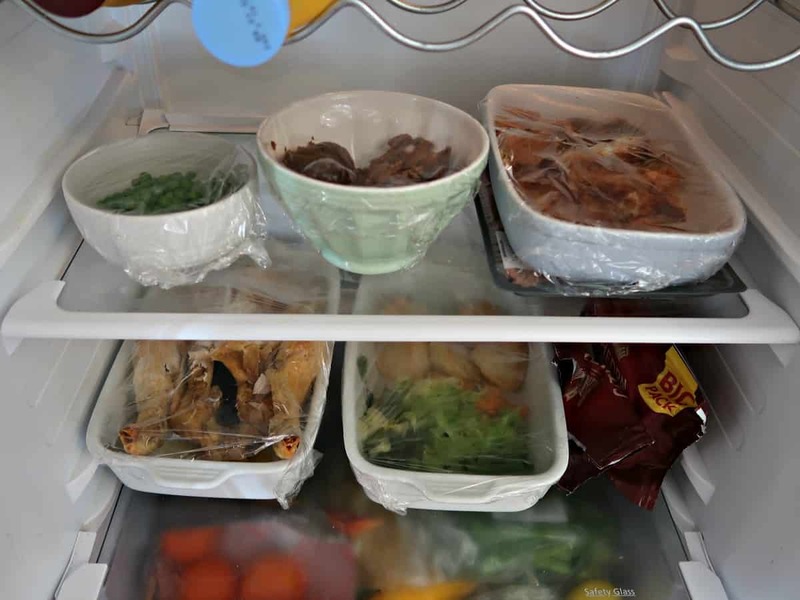 The samples shown in the refrigerator look clear, but the end products shown are all opaque . How are they made see-thru?